Plankton are small organisms that live in open water aquatic habitats, below the surface and above the bottom. They are the base of the aquatic food web, as plant-like members of the plankton (phytoplankton) that have chlorophyll-a and fix carbon through photosynthesis, and in turn are grazed upon by animal members of the plankton (zooplankton). These zooplankton are then eaten by larger animals such as fish (nekton). The zooplankton community in estuaries, including the Delaware Bay, includes holoplankton which are animals that live their entire lives in the water column (such as copepods). There are other animals, called meroplankton, that are present in the water column as larva but then metamorphosis into juvenile and adult stages. 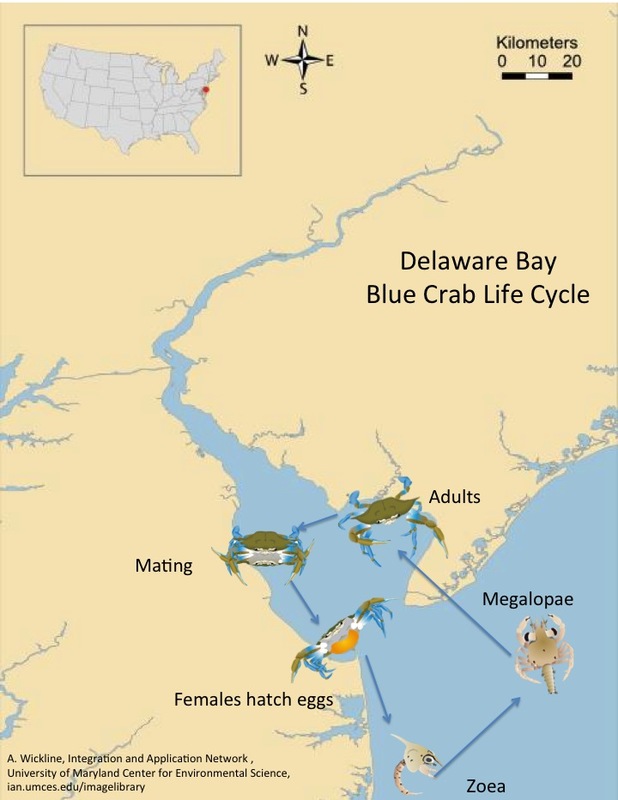 Common meroplankton in Delaware Bay are blue crabs, which have a life cycle that starts as an egg and proceeds through several planktonic zoea larval stages before settling to the estuary bottom. Because of these different lifestyles, zooplankton are identified by their use of the water column as a habitat and a heterotrophic mode of obtaining energy, rather than by their being in any one taxonomic group. Here is a video that shows you the life of a crab from when it is attached to its mother, throguh zoea and megalopa stages, all the way to becoming a juvenile. Click here for more information on crab development. Zooplankton range from ~20 μm to over 200 cm, but most are in the range of millimeters to a few centimeters. Their small size is important to understanding their biology. All plankton have a very limited ability to overcome horizontal currents (plankton comes from the Greek word planktos, which means wander or drift). Despite this limitation on horizontal movement, zooplankton often can undertake remarkable vertical migrations, helping them find food and avoid predators. 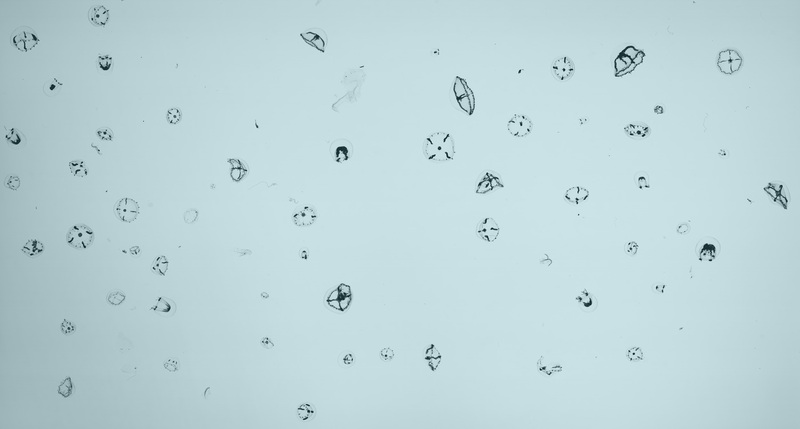 Zooplankton vertical migrations can be 10,000 to 50,000 body lengths each day. This is equivalent to a human walking a roundtrip distance of 50 miles each evening to get dinner! Zooplankton are heterotrophic, and while many are herbivores that feed on phytoplankton, others are carnivores, detritivores, and omnivores. Zooplankton utilize different strategies to obtain food. Suspension feeders draw in food particles from the surrounding water via a filtering or trapping mechanism, while raptorial feeders actively hunt their prey. Typically, zooplankton biomass and species diversity decreases with depth in the ocean, which is related to food availability decreasing with depth. 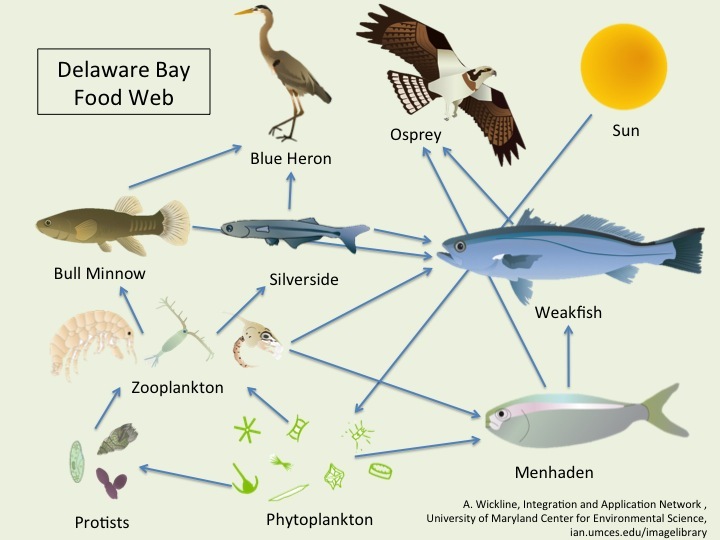 Seasonal patterns of zooplankton abundance are similarly related to patterns of food abundance, with increased zooplankton abundance in Delaware Bay following the large spring phytoplankton bloom, as well as the smaller fall bloom. This seasonal cycle of phytoplankton can be seen in images below of sea surface chlorophyll-a in and around Delaware Bay, measured from the Moderate Resolution Imaging Spectroradiometer (MODIS) onboard the NASA Aqua satellite and availble through NOAA CoastWatch. In the time series of images, warmer (redder) colors mean higher chlorophyll-a concentrations, and therefore more phytoplankton. Zooplankton cannot be measured effectively from satellites, but they can be predicted because zooplankton are often abundant when their phytoplankton prey are abundant. Increasingly, there is concern that zooplankton and other marine animals are eating small pieces of plastic that enters the water from human activity, such as plastic beads found in personal care products, and the breakdown of larger plastic pieces like bags and fishing line. Click here to learn more about our studies on microplastics in Delaware Bay. A major difficulty in planktonic life is the tendency for zooplankton to sink in the water column. Accordingly, zooplankters commonly possess structural adaptations to reduce sinking, including storage of low density fluids (e.g., lipids), along with flattened and elongated shapes to increase drag. Please provide your email and role to download the requesed files.